Several hundred films based on Shakespearean material were made in cinema’s ‘silent’ era. What economic and cultural ambitions combined in order to make Shakespeare such attractive source material for the film industry? What were the characteristic approaches of particular production companies and of particular national film industries? How were silent Shakespeare films marketed, distributed, exhibited and received? Through a series of close readings, and drawing upon a wealth of fresh primary research, this engaging account tells an evolving story that both illuminates silent Shakespeare films already known, and brings into critical circulation other little known films not yet commercially available. Subjects covered include nineteenth-century precursors of silent Shakespeare, the film industry’s transitional era, the many Shakespeare films of the Vitagraph Company of America, films of the 1916 Shakespeare tercentenary, silent films of Hamlet and Asta Nielsen and Emil Jannings as the stars of German Shakespeare films of the 1920s. Judith Buchanan is Senior Lecturer in Film Studies at the University of York and the author of Shakespeare on Film. With a background in early modern literature, she now writes on silent cinema, on literary and biblical adaptation in the cinema, cinematic authorship, bodies on film and cinema’s material legacies. She provided the introduction and voice-over commentary for the British Film Institute’s Silent Shakespeare DVD. 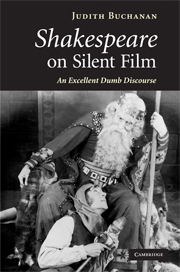 Shakespeare on silent film : an excellent dumb discourse / Judith Buchanan. History and criticism. 4. Film adaptations–History and criticism. [In these silent films] it struck me that I was witnessing a dead art, a wholly defunct genre that would never be practiced again. And yet, for all the changes that had occurred since then, their work was as fresh and invigorating as it had been when it was first shown. That was because they had understood the language they were speaking. They had invented a syntax of the eye, a grammar of pure kinesis …It was thought translated into action, human will expressing itself through the human body, and therefore it was for all time … They were like poems, like the renderings of dreams, like some intricate choreography of the spirit, and because they were dead, they probably spoke more deeply to us now than they had to the audiences of their time. We watched them across a great chasm of forgetfulness, and the very things that separated them from us were in fact what made them so arresting: their muteness, their absence of color, their fitful, speeded-up rhythms. These were obstacles, and they made viewing difficult for us, but they also relieved the images of the burden of representation. They stood between us and the film, and therefore we no longer had to pretend that we were looking at the real world. The flat screen was the world, and it existed in two dimensions. The third dimension was in our head.